Content by Tony Macklin. Originally published on July 30, 2012 @ tonymacklin.net. 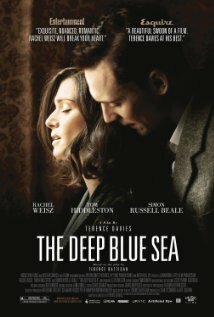 The Deep Blue Sea is a fitful, poignant film about failed love. It's a movie that casts a harrowing spell. Adapted from the play written by Terence Rattigan, The Deep Blue (1952) is set "around 1950." It focuses on Hester Collyer (Rachel Weisz) and her total, fervid commitment to love with a former RAF pilot Freddie Page (Tom Hiddleston). Hester is married to William Collyer (Simon Russell Beale), a judge much older than she is. He treats her kindly, but they have no children and he dotes on his aristocratic mother (Barbara Jefford), who holds Hester in mean-spirited disdain. When Hester - we see many scenes in flashback - meets the former ace pilot, she falls in all-consuming love with him. He returns love, but in no way can he match her fervor or commitment. Hester leaves her husband to live in a small flat with her lover. She plans to divorce William, who at first is angry but later becomes comforting and solicitous when Hester is suffering duress. But Hester only has love for Freddie. Words fail. Freddie has little class and no knowledge of modern art, dismissing Cubism at a gallery. But her love doesn't waver. When Freddie forgets her birthday, it contributes to driving her to an act that changes their relationship and foreshadows its fate. William, still her husband, for her birthday belatedly gives her a book of sonnets, which she "loves." But his sensitivity is no match for the force of her undiminished love for the other man. In The Deep Blue Sea love is irrational. The landlady (Ann Mitchell) says, love traps one "between the Devil and the deep blue sea." Her vision of love is taking care of her sick mate as he deteriorates. Freddie's love is not Hester's. He "loves" her, but with neither power nor deep commitment. Freddie says their love is "lethal." It can't endure her relentless pressure. Director/writer Terence Davies creates a world of stricken, post-war London that at times is poetic. It's an apt setting for a stricken love affair. Davies depends on flashbacks which effectively fragment his story. He beautifully adapts Rattigan's play. The characters are heterosexual, but since playwright Rattigan was gay, The Deep Blue Sea also can be seen as representing the struggles of a gay man in the early 1950s. Davies cleverly uses potent music to heighten the melodramatic aspects of his story. Samuel Barber's Violin Concerto sobs and throbs. Another evocative, enhancing choice is the terrific use of Jo Stafford's full-throated, stirring rendition of "You Belong to Me". And a crowded pub all join in singing the romantic 1950s American classic. Davies also uses Eddie Fisher's version of the ballad "Anytime" to considerable effect. In the underground, a sweet male voice (Stuart McLaughlin) croons "Molly Mallone" as the camera pans people hiding in the Tube as the blitz takes place over them. William and Hester stand among them. The Deep Blue Sea relies essentially on the actress who portrays Hester. Rachel Weisz gives a compelling, multi-layered performance as the love-struck heroine. Hester is both formidable, vulnerable, strong and weak, and Weisz admirably plumbs all her facets. Tom Hiddleston, although not equal to Weisz, captures the likable superficiality and fickleness of the man who lives in his warrior past. Especially convincing is Simon Russell Beale as William, who finds that decency and dignity don't matter to his driven wife. He is both befuddled and tender. Davies has a strong sense of imagery. His London is dark wood and dim streets. He ends his love fable with irony - a baby carriage and running children. Out of a world of ruin comes life. The Deep Blue Sea is an eloquent love song. It's both hauntingly pitiful and very human. It's love in all its labor.